With Europeans on holiday for All Saints’ Day, cyclocross descended upon the hills of Flanders for the annual Koppenbergcross. 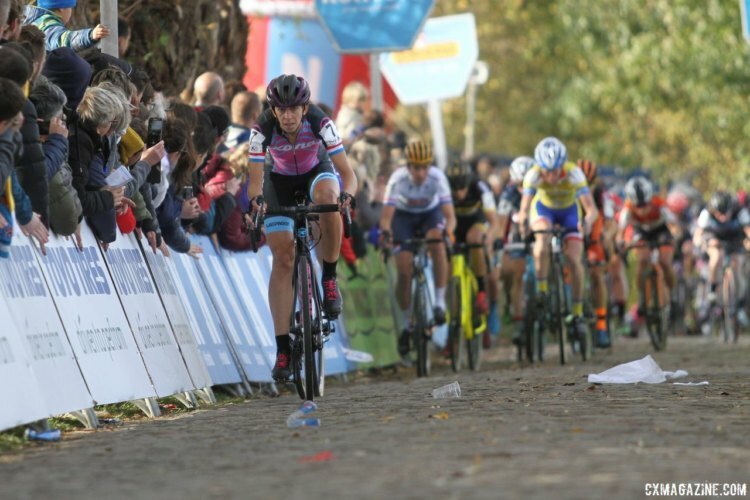 The event is renowned as one of the classic cyclocross races thanks to its famed cobbled climb and descents through the fields outside Oudenaarde. The last two Koppenbergcrosses have belonged to Belgian Jolien Verschueren (Pauwels Sauzen Vastgoedservice), whose climbing skills are perfectly suited for the hillside race. 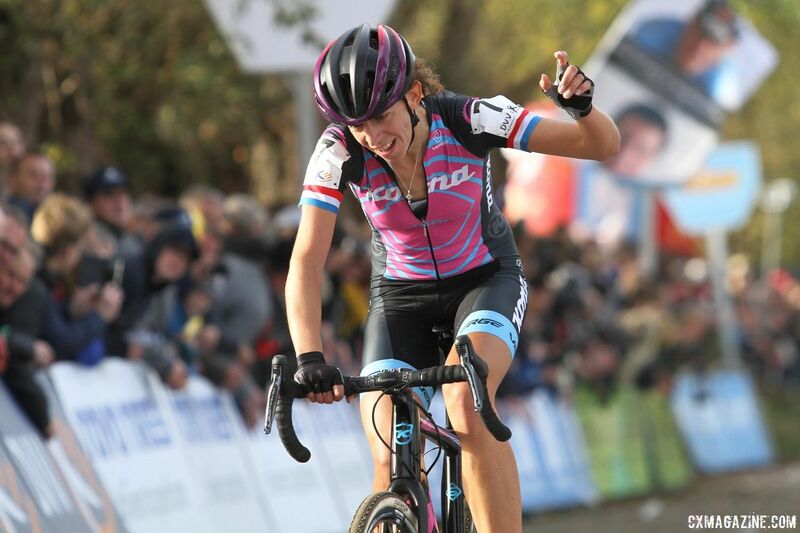 Looking to take back the crown and take home a piece of the Flanders cobble was Helen Wyman (Kona Factory CX Team). Wyman has won the event before—last in 2012—so she knows what it takes to handle the venue’s steep challenge. Wyman’s veteran status contrasted with that of Koppenberg greenhorn Katie Compton (KFC Racing p/b Trek/Knight Composites). Since the race is part of the IJsboerke Ladies Trofee, Compton took to the start line for another of her bucket list races before heading back to the U.S. to race the Pan-American Championships in Louisville on Sunday. 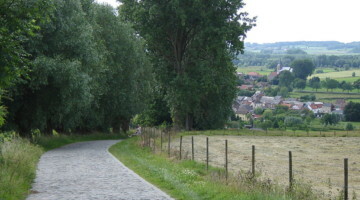 The Koppenberg circuit was similar to last year’s in that it finished atop the Koppenberg hill. How riders got there, however, was a little different. This year, the finish was on the famed cobbles, but not as far up the hill. The World’s best road riders who contested the Tour of Flanders earlier this year would have been at home on the climbing portion largely confined to the Steengat road. Once at the top, there was still a long grassy descent to tackle before climbing the hill once again. 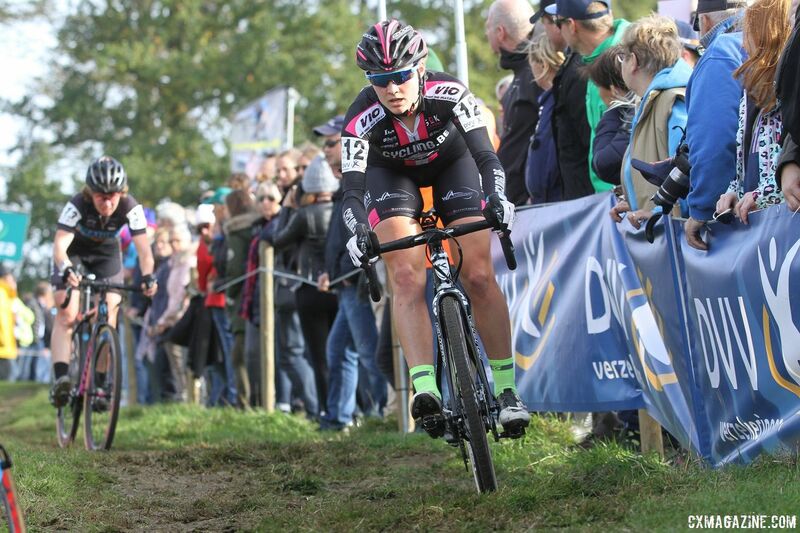 The descending favored Compton and her mountain bike skills, while the climbing is a Wyman and Verschueren forte. Only one of them would get to take the cobble home for the trophy shelf. The first two races of the holiday afternoon were dominated by the British. Ben Tulett won the Junior Men’s race and Tom Pidcock won the U23 Men’s race. Wyman was looking to join her countrymen in the winner’s circle. 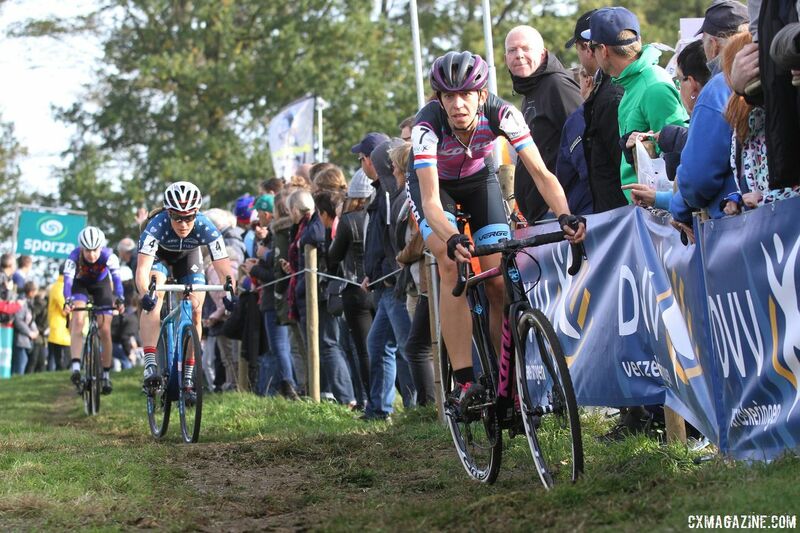 She wasted little time getting to the front of the field on the prologue climb of the Koppenberg. Compton joined her for an open, grassy view of the new course and early on, Geerte Hoeke was there as well. The first time down the grassy descent, Compton was content to let Wyman lead the way. Compton is always looking for descents where she can use her skills to pick up easy seconds with her handling, so it was unlikely this arrangement would continue into the heart of the race. 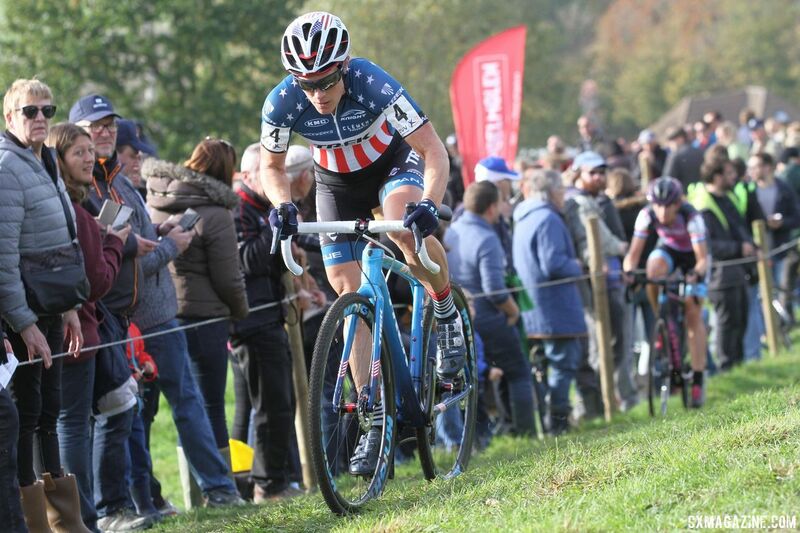 Once Wyman and Compton hit the cobbles at the bottom of the climb, the next few minutes would provide the blueprint for much of the rest of the race. Wyman opened up a three-second gap on the cobbled climb, and then Compton recovered and took the lead on the descent. Once on the downhill, Compton opened up a gap on Wyman. At the bottom, the pattern repeated. Compton’s descending versus Wyman’s climbing. 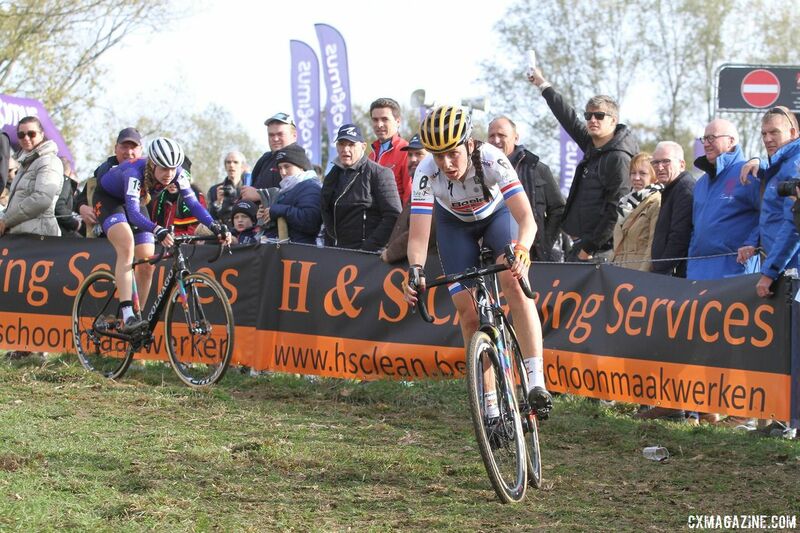 Jolien Verschueren’s second lap provided a foreshadowing of which skill was likely to be more decisive. The Belgian started the climb in a group with Nikki Brammeier (Boels-Dolmans) and Hoeke. By the summit, she had picked up 18 seconds on the other two riders. She was down in her quest for three straight wins, but certainly not out. 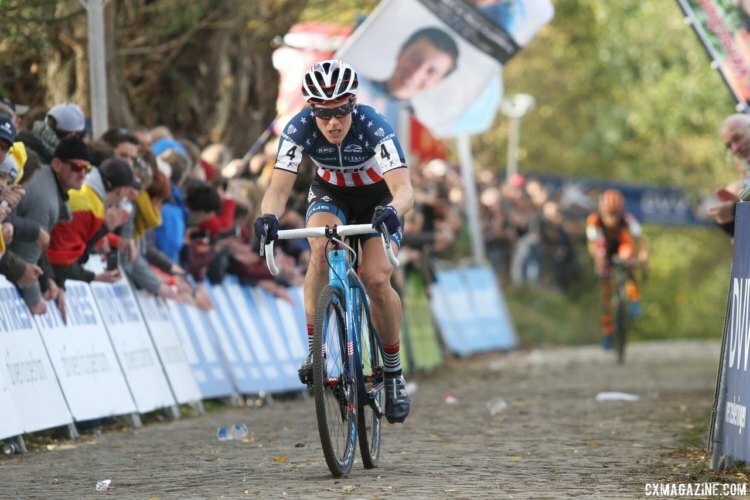 Each lap during the middle of the race, Compton went bombing down the Koppenberg, but Wyman showed as a member of a team with Barry Wicks, Kerry Werner and others, she has some handling skills of her own. She kept the gaps close enough at the bottom that she could close on the climb. During the penultimate lap, Compton again went to the front. However, this time, shortly before the exit onto the cobbles, Wyman sprung into action. She jumped to the front and as Dave Towle would say, it was on like Donkey Kong. Wyman exploded up the cobbled climb with a look of determination on her face. 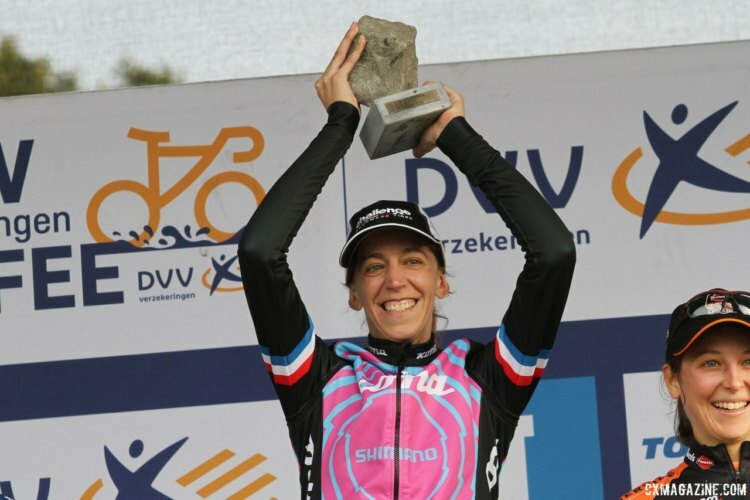 In a season where she has taken home some interesting podium prizes, she clearly wanted the cobble more than any giant wheel of cheese. Her gap at the top of the Koppenberg was 11 seconds. Compton could not keep Wyman’s pace, and suddenly, she had the two-time defending champion to worry about. At the climb’s apex, Verschueren was just four seconds behind her. 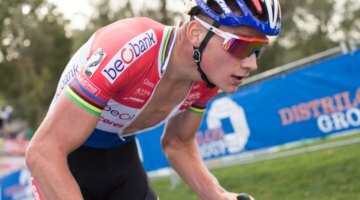 There was one more descent for Compton to rip it, but there was also another climb for Verschueren to lithely rumble up the last climb. The 13-time defending U.S. champion showed little concern for her competitor in third. Turn by turn, she closed the gap to first. Near the bottom, she almost regained Wyman’s wheel. Although most of the climbing was on the cobbles, there were still some shorter uphills in the fields. 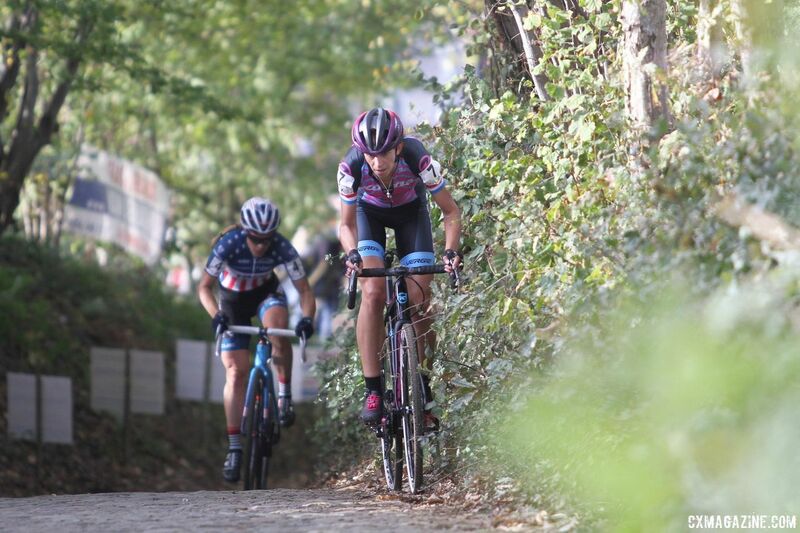 A timely incline allowed Wyman to re-engage her climbing legs and deny Compton’s challenge to her lead. Wyman hit the final climb in a solo first and let out a smile/grimace/grin at the top of the hill. 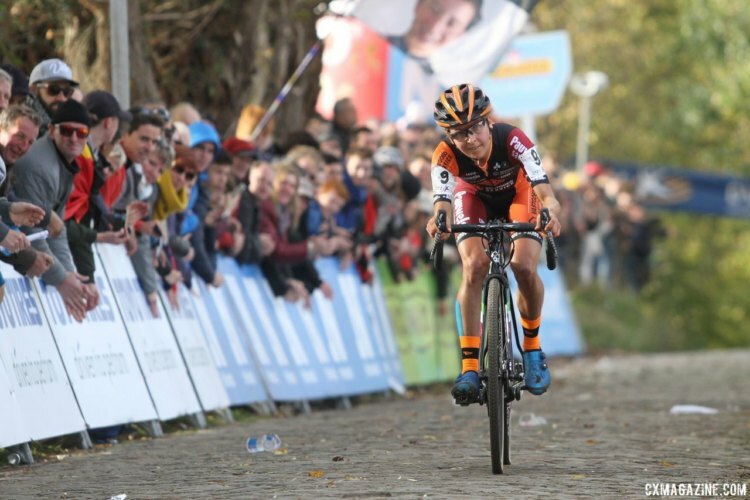 The prized cobble and another Koppenbergcross title were hers. Even if Compton’s descent did not catch Wyman, it put a gap on Verschueren the Belgian climber could not close. Compton snagged an impressive second-place finish. 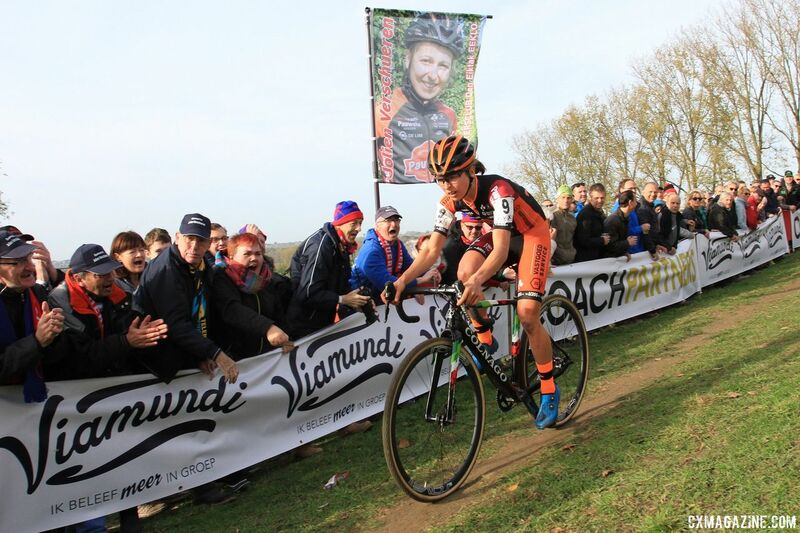 After Maud Kaptheijns (Crelan-Charles) had a tough afternoon, finishing eighth over two minutes behind the winner, Compton retained a comfortable one-minute lead over Wyman in the IJsboerke Ladies Trofee overall standings. 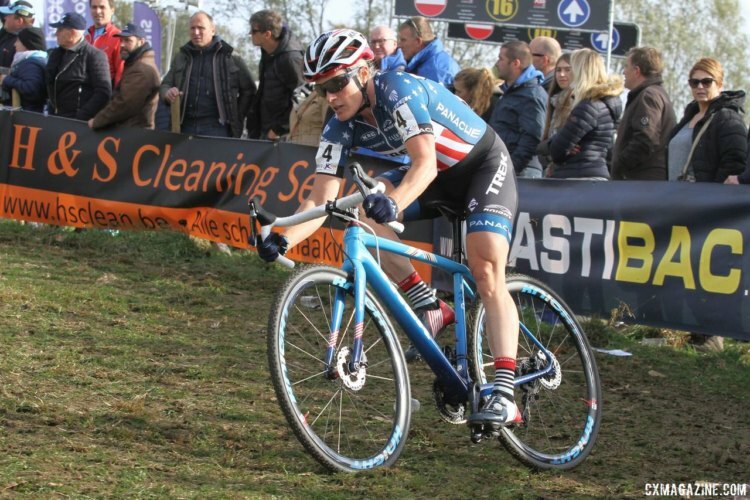 Brammeier had a strong ride, finishing fourth, and Kim van den Steene took fifth.